With the upcoming BYU Conference on Family History & Genealogy (BYU Campus July 27 - 30, 2010) it is likely that FamilySearch will take the opportunity to announce or introduce changes to either New FamilySearch or the older FamilySearch.org Website. The FamilySearch.org Website is the best candidate for changes. There has been a Beta test of a new format going on for more than a year. The interface is a fairly substantial change from that of the current FamilySearch.org startup page. The older site has some explanations and references to the resources available but the newly proposed Beta site eliminates all of the references to news, events, the Family History Library or Personal Ancestral File software in favor of a less cluttered cleaner look. The Beta site is not yet fully functional. Many of the links are not fully operational and some of the information is lacking. For example, the whole right part of the startup screen is entitled "What's New." Clicking on this area takes you to a page entitled "Why you'll love FamilySearch." However, there is really nothing on the page about any new developments or features. There is a link entitled "Take our new search out for a spin." But clicking on this link merely takes you back to the startup page. This is not a fault in the new website, it is a sign that the site is still under development. How much storage is 3 Terabytes? (That's 3000 Gigabytes). Seagate claims that the drive can store up to 120 HD movies. The cost of this new (June 29, 2010) hard drive? $250. Quoting from the announcement, "The drive is compatible with a Windows PC or Mac. Each drive includes an NTFS driver that's installed on a Mac, making it possible for the drive to store and access files from either system without reformatting. In striving to produce higher capacity drives. Seagate and competitors are trying to stay ahead of the growing need for storage as people use their computers for storing high-definition video, pictures and music. Seagate says its latest drive can store up to 120 HD movies, 1,500 video games, thousands of photos or "countless hours" of digital music." Now, why would a genealogist need all that storage capacity? Digital copies. My camera and my scanners make wonderful tools for digitizing all of my paper files, but all those images really add up to a fair amount of storage. My current iMac computer has a 1 TB internal drive, but I presently have a 2 TB backup drive. The reason for the extra capacity is a program called Time Machine from Apple. To back up all my images and the rest of the stuff on my computer, presently takes 1.84 TB! It will not be too long before I will "need" a 3 TB drive just to make one backup of my files. Even if you cannot imagine ever needing a 3 TB drive for your computer, be thankful they keep coming out with newer, larger capacity drives. That makes the smaller drives that much less expensive. The release of this new drive will undoubtedly drive down the price of smaller capacity drives. The present price of a 1 TB drive is about $79 and 2 TB drives are about $129. As other manufacturers release drives with equal or higher capacity the price will probably drop. What is the most widely spoken language in the world, outside of Chinese? Well, it depends on how and who you count as a native language speaker. On any list of top languages, Spanish is either number two behind Chinese or very close to the top. Most estimates put the number of Spanish speakers in the world at around 329 million. There are estimated to be over 20 million Spanish speakers in the U.S. alone. See study by the Summer Institute for Linguistics and other studies as quoted by Saint Ignatius High School and Infoplease. I don't think anyone would consider genealogy as a widely popular pastime or interest for Spanish speakers, but that might change as more and more Spanish language records become available on the Internet. FamilySearch's Record Search continues to add more records, especially from Spanish speaking countries. Recent additions include records added to the 1930 Mexico Census, Mexico, Catholic Church Records, Mexico, Civil Registrations 1860 - 1950, and Mexico, Distrito Federal, Catholic Church Records 1886 to 1933. Other new records in Spanish were added to the Argentina, Catholic Church Records, Costa Rica Church Records 1595 - 1992 and Puerto Rico Civil Registration 1836 - 2001. Record Search's collections are not limited to Latin America, new records were also added to Spain, Catholic Church Records 1500 to 1930 and Spain, Municipal Records. Although records have been added to the above collections, some of the collections are still incomplete. For example, the Mexico Catholic Church Records now cover 14 of 31 States not counting the Federal District which has its own collection of records. Another example, the 1930 Mexico Census is now 62% complete. Additions to the Spanish Catholic Church Records bring the total to 7 out of 52 provinces. If you are interested in researching in any of these areas, it is a good idea to check the progress of the collections from time to time. There is no where else on the Internet where such are large number of original source records in Spanish can be easily found. Years ago there was a Bazooka Joe comic where Mort was looking around on the ground under a street light. Bazooka Joe comes up and asks him what he is looking for. Mort replies that he lost a quarter. "Where did you lose it?" Over there! "Why are you looking under the light pole? Because that is where the light is! This last week at the Mesa Regional Family History Center I ran into this same problem, looking where the light is. I was helping one of the patrons look for information on a death date and place of a great-grandfather from Ontario, Canada and I was showing her how to search in the Family History Catalog by place name. We found a book listing all of the cemeteries of Ontario, so I showed her how to find the book in a library and obtain the book by Interlibrary Loan. At this point, she said, "I don't want a book, I want to find the information online. In other words, she didn't want to look where the information was located, she wanted to look where the light was. It will be a long cold day in August in Phoenix before all of the information in books and paper records migrates to the Internet. 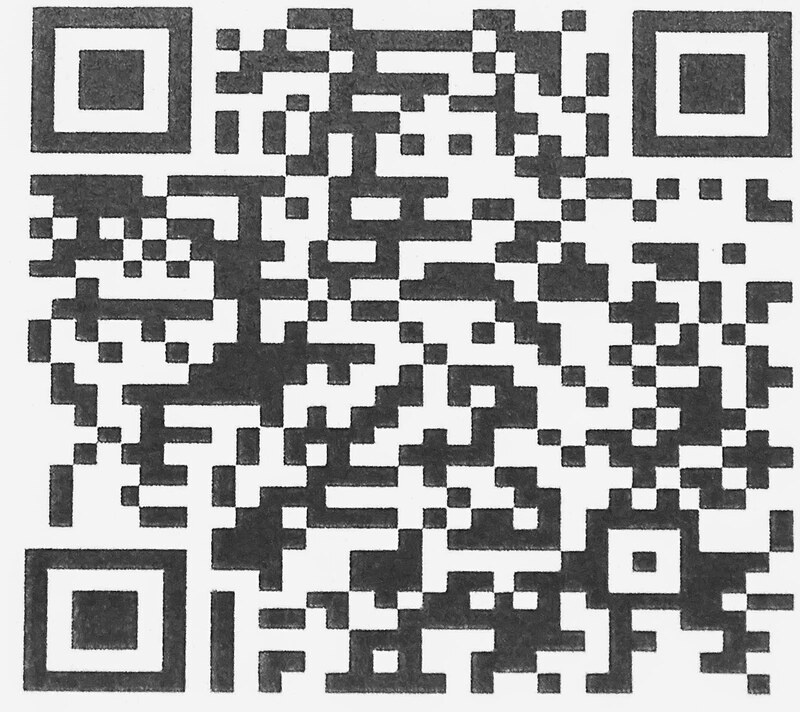 One simple reason is the physical need to scan or copy the information. Another problem is the copyright issue, that is, obtaining the rights to put a book or document online. This takes time and money. One example, The Church of Jesus Christ of Latter-day Saints has somewhere around 2.4 million rolls of microfilmed genealogical records; 727,000 microfiche; 356,000 books, serials, and other formats; over 4,500 periodicals; 3,725 electronic resources, but they don't have a copy of some of the genealogy books I have in my own library. So even though they have a huge project to digitize those records, they will probably take a long time to get to some of the books I have. Another example, I have found copies of paper records in cemetery offices across the country. These records usually concern the purchase of the gravesite, the erection of the monument and other issues. Very, very few of these cemetery records have made their way online. One very large cemetery, Westminster Cemetery in Philadelphia (actually Bala Cynwyd, Montgomery County) has only 929 internments in Find-a-Grave out of thousands and no record of any of the dozens of Lintons buried in the cemetery. If you want to know about the Lintons in the Westminster Cemetery, you have to go there. The irony of the situation with the patron at the Mesa Regional Family History Center is that there are over 17,000 books, 126,000 rolls of microfilm and 52,000 microfiche in the Mesa Center. All of which were unavailable to this patron because she wanted to only search online where it was easy to find records. Let's start looking the dark and dusty places. 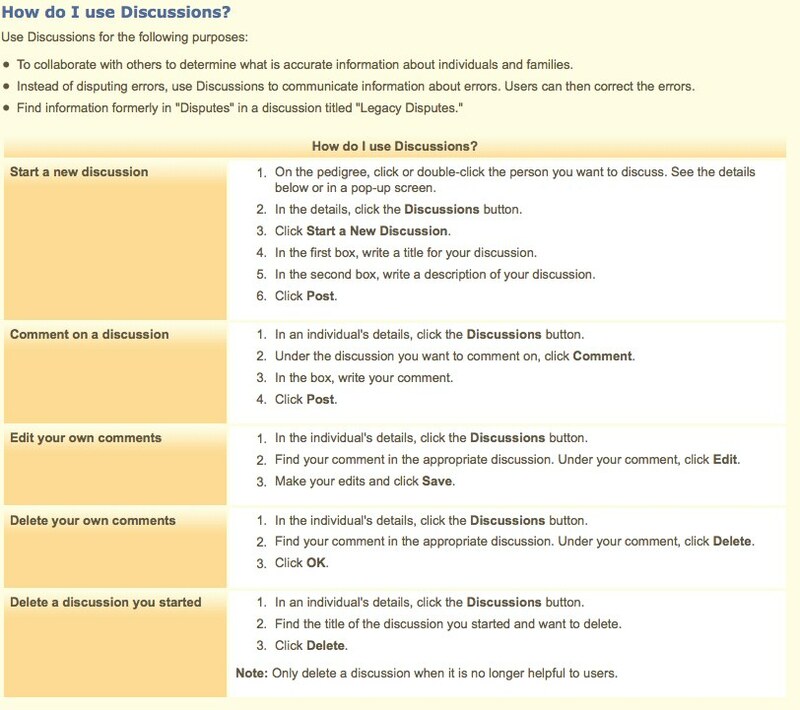 There is a button to "Start a New Discussion." Starting a discussion is similar to starting a new thread in a forum, your give your discussion a title and then start typing away. The program automatically adds an attribution with the date created and the date of the latest comment. It is that simple. I suppose that there is some limit to the length of the comments or discussions but they haven't mentioned one. Offensive or abusive language or content. Information that might harm or embarrass living relatives. Links to external Web pages with inappropriate content. Solicitations for business or research services. Well, what about Discussions vs. Disputes? A discussion sounds a lot less confrontational than a dispute. The Dispute function did not work well. Once a person or fact was disputed, it could not be changed without the disputing person removing their dispute. Disputes were visible but didn't seem to slow down people from adding more inaccurate information, if that is what they were supposed to do? One the other hand, this Discussion Tab is mostly invisible. There is nothing in the program to tell anyone that a discussion is available to read. People adding duplicates or wrong information with a GEDCOM file, will not ever see the Discussion Tab for the duplicate people they are adding. But it is a step in the right direction to start some dialogue in a more friendly fashion. Do I have a copyright to my online genealogy? There are dozens, perhaps hundreds of websites that promote storing and sharing your genealogy online. If you do succumb to the allure of online genealogy, what, if any, rights do you lose and what rights do you maintain? Mixed in with these issues are both moral and legal questions that eventually will have far reaching consequences as to what kinds of information will find there way into online storage. I frequently encounter people who are hesitant or even refuse to put "their family information" online. The concerns range from fear of "identity theft" to real privacy concerns. Many people are confused about online copyright issues and believe that by posting their genealogy online, they will lose their copyright and therefore all control of their family files. The status of information shared online is a very broad and complex subject that involves folklore-type misconceptions as well as basic personality issues. Unfortunately the law concerning online privacy and copyright are in rapid state of flux. Often, the legal principles involved are far removed from the actual online practices. I have addressed these issues a number of times in the past, but a recent comment got me thinking again about the issues involved in putting family information online. Does the Flickr hierarchy of choices add any real protection to a copyrighted work? Not likely. So what if I put my photo online, am I protected by copyright law? The answer is clearly yes. See Section 102 of the Copyright Law. If I use Flickr's system of sharing, do I lose any of the rights I might otherwise have? That is a very difficult question and could only be answered on a case by case basis. Now, back to genealogy files. What if I put my Personal Ancestral File file online? The Copyright Law recognizes a "digital transmission." See Pub. L. No.104-39, 109 Stat. 336, 348. So, putting the copy online is publication according to the copyright law. The interesting case of, Hotaling v. Church of Jesus Christ of Latter-Day Saints is illustrative. See Hotaling v. Church of Jesus Christ of Latter Day Saints, 118 F.3d 199 (4th Cir.1997). Quoting from the case of Arista Records LLC v. Greubel, 453 F.Supp.2d 961 (N.D. Tex. 2006) "The copyright holder of various genealogy research materials sued the church after learning that the church had made unauthorized copies of the research materials and placed those copies in its library collections across the country. The church was unable to produce records to reflect whether the materials had been loaned out to the public, but the plaintiff argued that the fact that the libraries had the unauthorized copies in their collections, and thus available to the public, constituted distribution within the meaning of copyright law. Id. at 203. The court agreed with Hotaling, and ruled that the library, by adding the work to its collection, listing the work in its index or catalog system, and making the work available to the borrowing or browsing public, had completed all steps necessary for distribution of a copyrighted work. Id. But see Arista Records, Inc. v. MP3Board, Inc., No. 00Civ. 4660(SHS), 2002 U.S. Dist. LEXIS 16165, at *13-14 (S.D.N.Y. Aug. 28, 2002) (distinguishing Hotaling on the ground that proof of dissemination was not available to Hotaling through fault of the alleged infringing party and reiterating that proof of actual use by the public is usually required to establish distribution)." The issue of putting your family file online and whether or not you have a copyright will not depend on the question of distribution, but on whether or not the information contained in the file is subject to copyright. As long as the file contains nothing but facts, names and dates, it is unlikely to have copyright protection. As soon as you add personally composed or written material, histories, narratives, or commentaries, that portion of the work may then become copyright protected. If you include the work of others in your submission, to the extent that their work is subject to copyright, you may liable for infringement. So, the answer about having a copyright on your online genealogy has various answers depending on the nature of the information; facts or dates vs. narration, or the amount of creativity in the work. See the Hotaling case above. Likewise, if you include photos, if you took the photo, you probably have copyright protection, if not, or if the photo is old, the copyright may lie with someone else or be expired. It is a good idea to know your rights and obligations before loading files online. A number of prominent blogs posted an announcement from FamilySearch concerning "Twenty-nine new collections were updated or added this week at FamilySearch.org—with 26 million names and 1.5 million digital images!" I noted some time ago that FamilySearch had stopped announcing new collections on its start-up page so I was interested to see what had happened with the "new" collections. The Record Search website is a valuable new source of original digitized records as well as newly minted indexes covering many heretofore unsupported areas of the world. But I had been checking the site regularly and was surprised that so many records had been added this last week when I had checked the site two or three times since Sunday and had not noticed a huge influx of new records. So off to the site to check out the "new" records. Hmm! The first records listed on the announcement were Costa Rican Church Records. There was a red star marking additions to Costa Rica Church Records, 1595 - 1992. The record search page indicates that the records were last updated on 17 June 2010. Clicking on the "About this Collection" link takes you to the FamilySearch Wiki page for these records. Looking at the revisions for the Wiki page shows that the Wiki page for this record collection has been online since 26 May 2009. The record collection has been online since, at least, 20 May 2010. So what does it mean that the records are "new?" It may mean that the records were updated and new records added to the collection but not necessarily that the collection is "new" to Record Search. What does it mean that the records were added within the last week? You have to look carefully at the comments section of the announcement. For the Costa Rican records the notation is "Waypointed images." Now, what does that mean? In fact, nearly all the records added were "Waypointed images." Google does not have a definition for "Waypointed images." A waypoint is a reference point in physical space used for navigation. Just guessing but it might mean that the programmers were inserting indexing locations in the data or marking images for indexes. Anyone know? What else is "new?" The rest of the new material consists of updated indexes, linking new indexes to previously published images and providing new indexes. So there aren't really new collections just more index references and some new images. (Some means 1.5 million new images). You might want to look at the announcements carefully and consider what is actually being announced. The only really new index and images was for New Hampshire Deaths and it came online on 10 June 2010, a little more than a week ago. Record Search is a dynamic new source for original records and indexes. It is constantly changing and I recommend an occasional look to see what's new. But when they announce "new" records, check out what is really new images and what is new indexes. What is going into New FamilySearch? If you have had any interest at all in New FamilySearch (NFS), you are likely aware that the database was a conglomeration of several existing collections of records. Most of the records in each of the contributing collections were the result of individual submissions by mostly unsophisticated contributors. As a result, the information contained in any given record is certainly tentative and subject to further verification. For an in depth discussion of this issue, see The Evidence Architecture of the New FamilySearch Tree by the Ancestry Insider. His statement is a good summary of the problem, "The evidence management compliant architecture of NFS has given FamilySearch nothing but problems, so I expect they will discard it. One reason it has proven problematic is FamilySearch’s decision to preload millions of junky, sourceless evidence summaries (IGI patron submissions, Ancestral File, and Pedigree Resource File)." Given that the original information in NFS was lacking in accuracy, the question is now, can anything be done about the situation and what about the submissions that are currently going into the program? Since I am most familiar with my own family file in NFS, I will use an example from my own family of the present issues with the program. The original stated purpose of the program, in part, was to avoid duplication of LDS Temple ordinances and to facilitate collaboration among researchers. Some recent public statements about the program have indicated that the there is some indication that the program is being effective in eliminating duplication. I am not aware of any public statements about the effect of the program on collaboration among family members. Has progress been made towards either of these goals? I will start with an examination of my Grandfather who died in 1944. As far as his life is concerned, he is moderately well documented. We have photos, letters, a few physical personal items and abundant historical records. There is no dispute as to the accuracy of the basic facts of his life, i.e. birth, marriage, children, death etc. Looking at the entry in NFS, we find an entirely different story, right off we find twelve separate and conflicting entries for his birth information; two different months and three different locations with multiple variations of each. In examining each of the ten different entries, most of the differences are in the accuracy. He was born 12 January 1895 in St. Joseph (now Joseph City) Apache County, Arizona. The entries have him born in Utah and in June. If you go down through the submissions on LeRoy Tanner, on just his birth date, there have been a total of 38 submissions, so far. With the exception of my own verified submission, every last one of the others is inaccurate in some fashion. I put "so far" because regularly the number increases. When the program was introduced, there were no more than two or three entries. Why all the additional entries. Interestingly, LeRoy Parkinson Tanner had only two children who lived and from an examination of the contributors, it is doubtful that more than one or two of the contributors are actual descendants. Where do the other records come from? Apparently, distantly related individuals feel compelled to duplicate the information already in the program without checking the accuracy or the need for additional copies of the information in the file. How does this relate to the issue of duplication of LDS ordinances? If you look at the LDS ordinance information it is evident that all of LeRoy Tanner's ordinances were completed during his lifetime. But if you use a program such as RootsMagic to look at the information in NFS, you can immediately see that some of the ordinances have been repeated two and three times and even during the time NFS has been in use. If we go back one or more generations the duplication grows exponentially. None of this duplication is obvious in NFS unless you use a third-party program to catalog all of the duplicates. I agree with the Ancestry Insider that there are some technical shortcomings to the program, but the real issue is lack of user involvement with the program. There is apparently a significant number of people who believe it is there duty to put more and more information into NFS without regard for duplication or accuracy. The original faulty information is being augmented daily with additional inaccurate submissions. The inaccurate submissions result in variations in the dates, names and other information about individuals that then results in duplication of ordinance work. The problems with the information submitted about LeRoy Parkinson Tanner are minor compared to the wildly inaccurate information being submitted about more remote ancestors. It is not uncommon for unrelated individuals to be added as children, spouses, parents or other relatives and then immediately submitted for ordinance work. Even if you approach the information presented from an outsider standpoint, there are so many contradictions in the information it is practically useless as either a resource or to determine a family line. In this regard, the latest change to the program initiated a Discussion tab for each individual. Other than the fact that there is nothing in the program indicating that a discussion is available, this is at least a possible step in the right direction. But it does not address the core problem of the multiplicity of inaccurate information flooding into the program. Note: I am a lawyer in Arizona but nothing I say here should be taken as legal advice particularly about any specific legal issue or problem. If you need legal advice, please consult a lawyer in the jurisdiction where you live. I haven't been on TV for many years, but when I was, I was on TV as a lawyer. In a recent post John Newmark of TransylvanianDutch raised a very interesting issue involving RSS (Really Simple Syndication) feeds and feed readers such as Roots Feed. He included a number of links to sites questioning the practice of aggregation feeds and questioning the legality. Please read his post before reading the rest of mine, then you will know what I am talking about. The Federal District Courts have original jurisdiction in all copyright cases. This means that if you want to sue someone for a copyright violation, you have to do so in a Federal District Court not a local state or county court. This usually means that filing a copyright suit is almost always more expensive and time consuming than filing in a local court. So, I decided to check out the cases that had been filed in Federal Courts about RSS. Guess what? There are only four (4) cases in the entire court system that even mention RSS feeds. Diario El Pais, S.L. v. The Nielsen Co., (US), Inc.
Another guess what? The first two listed are the same case and the case had nothing to do with RSS. RSS was just one of the ways the class in a class action suit could be notified. Here is what the case said, "The Publication Notice will also be distributed through twenty-six Really Simple Syndication (“RSS”) feeds targeted to the Business/Finance channel, and through a national distribution of a press release issued through PR Newswire to both its US1 and Financial Markets newslines." The next reported case, Barclays Capital Inc. v. Theflyonthewall.com, may be of some interest to the genealogical community, at least those who worry about copyright issues. One of the holdings in that case was that plaintiffs who were alleging a hot-news misappropriation tort under New York law are required to show that the defendant's use of the information constitutes free-riding on the plaintiff's costly efforts to generate or collect it, thereby enabling the defendant to produce a directly competitive product for less money because it has lower costs. You can read the whole case by clicking here. The last case also had nothing to do with RSS feeds and the mention of the topic was incidental. Now, what does this mean? It means that so far, no one has challenged the use of RSS feeds in the manner in which some of the genealogy bloggers are complaining. At least, not to the extent of filing a Federal District Court case. Is the appropriation of blog content by aggregators legal? It might be and it might not be, but until a Court somewhere rules on a specific case, we can't really tell. Now, if someone out there in blogland knows about a case that talks about this issue, please let me know. There may be one somewhere that I missed by searching in WestLaw allfeds. Maybe after I have thought about the subject for a while, I will write a post giving my opinion. In a recent class at the Mesa Regional Family History Center, I had a class member ask about one of her ancestors. She indicated that they had been searching for his parents for a number of years. The first question I asked was the geographic location of where they were looking? She answered about a county in an Eastern state. I began a search for the towns in the county as she continued to give me more information. As the search progressed, she mentioned more than once that they had always searched for the individual only by name. As we continued to discuss the project, I found a comprehensive written history of the county through WorldCat.org. Then, I began looking for local newspapers. Time ran out before we got much further, but she left with an expanded idea of where you might go to look for an individual. Likewise, I have used the same technique to suggest that a certain individual never lived in a location. I think we often overlook the fact that genealogy is location based. It is too easy for two individuals to have the same name. I have even found people with my same name in a Tanner family book. Think about how many people you know with the same last name or the same first name and you will see the problem. I always start my search, when possible, looking for a location rather than a name. Is the place large or small or very small? Is it near a larger city or out in the country? Why would people move there? Have the same families lived there for years or is a transient area with few, if any, older residents? All of these questions and many more can help to establish a sense of place. In smaller towns, the local newspaper may have given the latest gossip and related who got married, who visited and who died, as well as every party and family gathering and who attended. I once found an entire family listed in a small town newspaper article with all their home towns when they came together for a memorial service one week after the old timer died. The paper had previously reported the obituary, but ran the article telling about the family when they got together to honor the name of the dead person. Sometimes, the place is more important than the name, especially if the name is very common. In Danish research, for example, there is a very small pool of given names and many individuals born about the same time may have the same exact name. In Denmark, the location of the family is very important down to the house they live in. It may be the only way you can tell your Jens Jensen from ten others in the same village. Sometimes, when I ask a person about their family, they have no idea where they lived. Until they find a geographical anchor they will always be sailing around in circles in a sea of names. In that case, I start with a series of questions. Where were you born? At least we know that the person's mother was at that location, at that time. Working backward, we have some places to start with. If the person was born in a certain county on a certain day, was there a record in the county of the birth? Is so, where is the record now. It is highly unlikely that all of the church records, land records, school records, insurance records, legal records, newspaper records, work records, and other types of records were all destroyed in a courthouse fire. By focusing on the location, you may find many alternative sources of records that are not apparent by only looking for a name. What do you know about the town where your parents (or grandparents) lived and worked? My recent experience in finding dozens of journals collected by one researcher and deposited in a university library's special collections, graphically shows that specific and pertinent information about your family could be anywhere. From the musical, The Music Man, one line always sticks in my mind, "But he doesn't know the territory!" Whenever I hear about searching for a name for years, I always say, "But they don't know the territory" and many times it is true. • Identify yourself as someone who is interested in or actively working on an individual or family line. • Coordinate the correction of errors and additional research with other interested users. • Identify incorrect information on the individual’s record. The discussions feature provides a cooperative environment where issues can be discussed and resolved. It has many advantages over the dispute feature, which discussions will eventually replace. • Adding a dispute blocks a user’s ability to make the needed corrections. Discussions do not. • The dispute feature is not cooperative. It is difficult to question a dispute, defend the disputed information, or add additional information that identifies correct information. • The discussion feature lets you work with users who do not allow the system to display their e-mail address or other contact information. • Offensive or abusive language or content. • Information that might harm or embarrass living relatives. • Links to external Web pages with inappropriate content. • Solicitations for business or research services. However, there is a "Report Abuse" link and there will be data administrators to review any concerns. In addition to the new discussion feature, New FamilySearch implements an exact search feature for names, event dates and event places. It is interesting that by using a third party program such as Ancestral Quest or RootsMagic to access the data, you could already find individuals by an exact search because all of the data included with the individual on your local database was included in the search. It will be interesting to see if the new discussion feature has an impact on the amount of poorly researched and inaccurate information being loaded into the program. One of the most obvious issues with the new discussion tab is that there is nothing in the program indicating that there is discussion going on. It is likely that the same people who do not take the time to edit or review their inaccurate entries will not take the time to read the discussions either. I am putting out a few discussions to see if anyone reads them. Why is Microsoft Office online for free? I did a Google search on the word "free" and got 7,500,000,000. That is about two frees for every man, woman and child on the planet. Some notable free products on the Internet are Adobe Reader, OpenOffice.org, Google Earth, RootsMagic Essentials, (you might not realize it, but Google Search learns from your previous searches and produces results consistent with those previous searches), QuickTime 7 Player, and on and on and on. So why would a company that makes zillions of dollars selling complicated software programs suddenly decide to give away their products for free? The answer is extremely complex. One of the concepts I have been thinking about recently is ownership. My past posts have talked about topics from who owns the genealogy companies to who owns genealogy in general. I think the first question that should be asked is whether or not anything is actually free? The Web has 15 different definitions of the English word "free." (see image above) In the sense used here, the best definition is "complimentary: costing nothing; "complimentary tickets"; "free admission."" I would submit that nothing on the Internet is free. Think about it. Do you spend any money to obtain Internet access? What about the cost of the computer? What about the connection fee? What about the cost of the electricity to run your computer/monitor/network connection? What about the time you spend at the computer? Even if you consider your own time to have no value, someone somewhere had to write the code, obtain server space and publish the "free" software. Have you ever purchased anything over the Internet? Some estimates of online retail sales for 2010 go as high as $173 billion dollars. Internet giant Google gives away free software for the simple reason that it saturates everything it does with advertising. Every "free" search and every "free" program comes with a huge number of ads for a huge variety of products. Now back to the main question, why is Microsoft giving away its software? The one word answer is "competition." Microsoft wants to make money from its products. But if OpenOffice and Google Docs are free and Microsoft Office costs anywhere from $150 to over $500, why would you spend the extra money to buy Microsoft's products. You would if you believed that the Microsoft product was worth the cost. Since Microsoft is not giving away its programs to advertise other people's products, it must be doing so to advertise its own products. Sort of like going into an ice cream store and getting a free sample. The store depends on the fact that the free sample will turn into additional sales of its products. Microsoft has the same goal, increase sales of its products. Look at the number of iPhones, iPods and iPads sold by Apple by giving away a lot of free software. Now, from the genealogy perspective. We have had free for a long time. (Not counting the cost of Internet overhead such as connection service etc.) Personal Ancestral File has always been essentially free. There have also been a fairly large number of free genealogy programs and services on the Internet. Personal Ancestral File is an interesting product. The Church of Jesus Christ of Latter-day Saints has no other tie-in products to sell and does not carry paid advertisements. But of course the Church does have some fundamental reasons to support genealogy. Those reasons have been enough in the past, to warrant the distribution of a free software program and a very good one at that. So why does RootMagic have a free version of their program? Back to advertising. The company is banking on the hope that giving away a free version of the program will entice more people to purchase their paid program. There will always be free offers as long as there are paid products. Some programmers believe that all software should be free. The motivation for this concept is very complicated but rational. But it is about as likely that all software will ever be free as it is that Ferrari will start giving away free cars. Unfortunately, having a basically free program like Personal Ancestral File has engendered a whole attitude among some genealogy software users that somehow all software should be free. That attitude will unlikely change so long as some companies give away "free" software. The survey's documentation covers social aspects of English language usage in different regions of the United States. It reveals distinctions in speech related to gender, race, social class, education, age, literacy, ethnic background, and occupational group (including the specialized jargon or vocabulary of various occupations). The oral history interviews are a rich resource on many topics, such as storytelling and family histories; descriptions of holiday celebrations, traditional farming, schools, education, health care, and the uses of traditional medicines; and discussions of race relations, politics, and natural disasters such as floods. The collection includes recordings from forty-three states, the District of Columbia, Puerto Rico, and parts of Canada. They were made from 1941 to 1984, with the bulk being recorded between 1968 and 1982. In some cases, transcriptions made by the collectors are available as part of this web presentation. 350 of the collection’s 405 recordings are available on this website; of these, 148 have accompanying transcriptions. The remaining recordings, which could not be posted due to copyright issues and other restrictions, may be heard in the AFC Reading Room in Washington, DC. It is possible that an ancestor's memory of a location or a name was influenced by the dialect spoken. In my own genealogy, one Great-great-grandfather's birthplace in Northern Ireland was recorded by his daughter who likely spoke a Western American dialect of English. One way to "translate" the location is to try and reproduce the original Irish-English accent and see if the results produces a real location in Northern Ireland. In this case, unfortunately, even using the dialectal assumption has failed to produce a verifiable location. Listening to a person speaking in the dialect of the area of your ancestors' origin could be one way to establish a connection with them not available in any other way. Can I claim a copyright on a digital copy? What if the original document or photograph is not subject to a copyright due to the passage of time, can you claim a copyright in a digital copy you make of the original? This was the question of one of my readers about my post on Arizona owning history. The ability of the U.S. government to implement a copyright law is derived from Article 1, Section 8, Clause 8 of the U.S. Constitution itself that states that Congress shall have the power "To promote the Progress of Science and useful Arts, by securing for limited Times to Authors and Inventors the exclusive Right to their respective Writings and Discoveries." The original Copyright Act of 1790 established a U.S. Copyright with a term of 14 years with a 14 year renewal. In 1831 the Copyright Act extended the term of a copyright to 28 years with a 14 year renewal. The Act extending copyright protection to photographs and photographic negatives (13 Stat. 540, chap. 126) was signed by President Abraham Lincoln March 3, 1865. The Act provided for the deposit in the Library of Congress of a printed copy of each copyrighted work within one month of publication and empowered the Librarian to demand such copy, with forfeiture of copyright as a penalty for noncompliance. Therefore, during the time period of the original act, unless a copy of of a photograph was deposited in the Library of Congress it would not have been covered by the copyright law. See also ETS-HOKIN v. Skyy Spirits, Inc., 225 F.3d 1068 (9th Cir. 2000). The Copyright Act of 1909 increased the renewal term to 28 year. Later acts increased the term to its present term of 95 years plus 120 years or the life of the creator plus 70 years. See this list of countries and copyright length. A document or photograph that does not have copyright protection either because of the age of the document or otherwise, is said to be in the public domain. It has long been the law in the United States that a copy of something in the public domain will not support a copyright. See L. Batlin & Son, Inc. v. Snyder, 536 F.2d 486, 490-91 (2nd Cir. 1976) as cited in Matthew Bender & Company, Inc. v. West Publishing Co., 158 F.3d 674 (2nd Cir. 1998). Of course, the trick is determining if something is in the public domain. In the case of the postcard to which the State of Arizona claims rights, the age of the card plus the fact that the creator of the card was listed as unknown indicate a work in the public domain. Even if the photographer had been known, a card created in 1910 would not be subject to any current copyright law. Currently, this area of the law is known as Intellectual Property Law and it is probably one of the more complex areas of the law along with tax law and securities. Here is a pretty good summary from Cornell University. Any work published in the U.S. before 1923 is now in the public domain due to copyright expiration. If a work was unpublished then the expiration date goes back to 1890 for both unpublished anonymous and pseudonymous works, and works made for hire and unpublished works when the death date of the author is not known. Also, unpublished works when the author is known are in the public domain if the author died before 1940. As a genealogist it is a good idea to have a basic understanding of copyright. It is not unusual to see limited publication books both online and in print that contain many obviously copyrighted reproductions. An ounce of prevention is really worth a pound of cure. Now back to the original question, can I claim a copyright on a digital copy? The simple answer is no, but with reservations. If you add your own creative element to the work, then your work may be copyrighted. But if you just scan the document or photograph, like was done by the State of Arizona, the copy cannot be copyrighted. This, of course, does not stop the State (or anyone else) from making the copy unusable by putting on a huge watermark claiming ownership. FamilySearch Record Search aka Record Search Pilot. Since its introduction, new collections and major updates have been announced on the start-up page. However, most recently no announcements have been made of changes at all. If you go to the site today, you will see the simplified search fields and little else. Clicking on an advanced search adds a few more fields but there is nothing telling a user what, if anything, you are searching. If you go to "Search or Browse our record collections" (which is redundant because all you have on the start-up page are search fields) you get a world map and a field that says (as of 18 June 2010) "All Regions (428)." Again, there is nothing to tell you what, if anything, you are searching except a vague statement that you can search millions of indexed records. Finally, if you click on "Browse Collections" you get a list of the collections with red asterisks marking new or updated collections. The first red marker is for "Nova Scotia Antigonish Catholic Diocese 1823-1905." Further clicking shows that the last update was 20 May 2010 almost a month ago. The next red marker is for the Mexico Census of 1930 which was updated yesterday on the 17th of June, 2010 and is now 62% complete. In this case, the description of the records is more informative. Continuing onward, the next red marker is for New Hampshire Death Records, 1654 - 1947 last updated on 10 June 2010. So, new may mean new, or it may mean relatively new or whatever. If the records show a percentage of completion, that must indicate that some records are missing, but if there is nothing about the level of completion, are we all to assume that the collection is complete? Moving on to the Family History Archives. 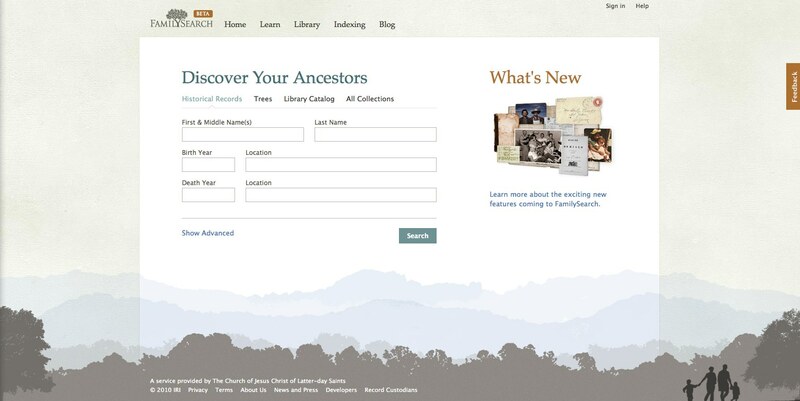 This is a collection of digitized published genealogy and family history books. Until somewhat recently, there was a tag line on the start-up page that told how many items were online. As of 18 June 2010, the tag line said, "There are 17751 items in this online collection." Only one problem, this number is much lower that it was in the past and it hasn't changed for about a month or more now. Are they still adding material to the collection? Did they remove a significant number of books and other items? At the bottom of the page it says "Last Modified 06/18/10" so it looks like someone is working, but there is no way to see what has been added. FamilySearch.org. The start-up page has very few changes. But, if you know, you can look at the Beta site of what FamilySearch.org may look like in the future. Of course, there is nothing on the main FamilySearch.org page telling you that there is a Beta. If you go to the Beta site, you will see another simple page (simple is good, maybe) but nothing telling you anything about the Beta test or even acknowledging what it is a beta test for. Clicking on the Blog link takes you to a number of articles, the last one concerning FamilySearch Indexing on 7 June 2010. Nothing about the Beta site, nothing about why there is a Beta site. In this case, we have a few broadcast E-mails and such to let us know a little about the two websites, but there is almost nothing you could glean from looking at the sites themselves. We have the same lack of overall information in the FamilySearch Wiki site, and all of the other websites. To the new user and to anyone not watching the pages regularly, these sites would never give anyone the idea that new material was regularly being added. How about a link to "What's New at FamilySearch" on every one of these sites, so that we all know to check back. I realize how hard it is to predict when a software change will be ready in the future, but public relations might be improved if a new user who goes to the Beta site for example, was told that it might replace the old FamilySearch.org website. Or not. Or whatever. When I go to the Record Search site for example, and I see a red marker for new information and find out that it really hasn't changed for a month or more, I might get discouraged and stop looking at the site for new records. By the way, it is my impression that Family History Center volunteers and missionaries in my classes ever check these sites regularly, because they think they know what is already there. How about some accurate news or communication. Another parting example, the FamilySearch Indexing start-up page says, "The key life events of billions of people are being preserved and shared through the efforts of people like you. Using our online indexing system, volunteers from around the world are able to quickly and easily transcribe the records—all from the convenience of their homes. 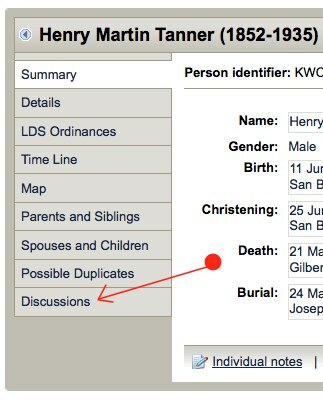 The indexes are then posted for FREE at familysearch.org." But guess what, THERE IS NOTHING ON EITHER THE FAMILYSEARCH.ORG START-UP PAGE (OR THE BETA) THAT ACKNOWLEDGES WHERE THOSE RECORDS ARE! If you happen to go to Search Records and if you just happen to know that the records are going to Record Search Pilot, then you can find the records, but otherwise, there is nothing telling anybody where the Indexing records are actually going. I would be glad to help with these challenges and I am sure there are a lot of other people who could help also. Does Arizona own the past? The Arizona Memory Project has online images from the Arizona Archives Historic Photographs. The photo above is dated from 1910 and the "creator" (photographer or printer) is unknown. 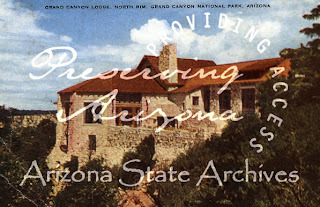 Prominently displayed over the photo is a watermark which says, "Providing access, Preserving Arizona, Arizona State Archives." The watermark is so obvious that the photo, as it is online, is entirely worthless for any purpose other than as to act as a sales agent for the State of Arizona. The Arizona State Library, Archives and Public Records, a division of the Secretary of State charges $12 for the print and the same for digital files at 150 dpi with a title bar. For digital files on CD, the State charges $17 for the first image and $12 for each additional image. 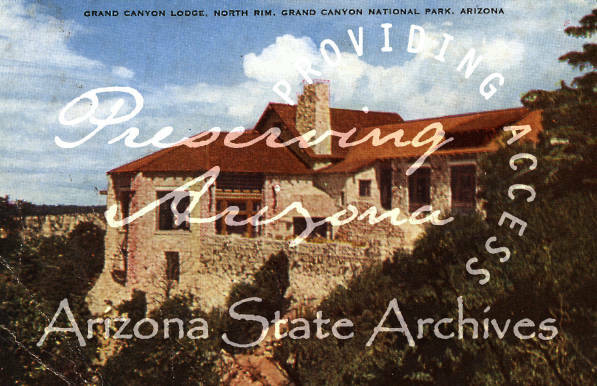 The question is, how did the State of Arizona acquire ownership of a postcard from 1910? In case you are wondering, the image is older than any possible protection by the U.S. Copyright Act and is technically in the public domain. Here is the Canyon side patio and fireplace of the Grand Canyon Lodge on the North Rim, just after reconstruction with chairs in place and some visitors, taken 15 July 1937 by the National Park Service. Notice the similarity between the above photo and the one for sale by the State of Arizona. However, the original lodge was destroyed in a fire in 1932. The question is simple, how can the State of Arizona claim ownership of a public domain postcard print from 1910? If you can answer that question, you can also answer how any number of people and entities claim ownership to their ancestors' history in writing or in pictures. There are six different versions of Office and not all of the above programs are available in all versions. The retail price on these products runs from $150 for the student editions to over $500 for the professional and premium packages. Microsoft has a bewildering array of permutations of the products that seem to add qualifiers to the basic nomenclature; for example, "Microsoft Office Professional Plus 2010." Because genealogists are mostly also computer users, it is almost certain that all of us using computers will come in contact with one or more of the Microsoft products. It is also obvious that those of you out there that are still struggling along with Windows 95 on your computer probably are not hot prospects for sales from Microsoft for Office 2010, but it is inevitable that at some point most users will be considering an upgrade. Is there some advantage to having your documents stored out there in cyberspace? Google seems to think there is. Microsoft's latest product is not an innovation, it is Microsoft playing catchup to Google Docs. Not mentioned in the news accounts, which focus specifically on the Microsoft/Google rivalry, is the presence of yet addition free online software such as OpenOffice. I use word processing and spreadsheet software all day, almost every day and yet I probably use fewer than 10% of the features available in any of the programs. Even after spending practically all of my adult life glued to a computer, I still find the number of features of a program like Microsoft Word to be overwhelming. For those of us who would rather spend more time doing genealogy and less time trying to figure out how to work a new program, it is unlikely that we will jump at the opportunity to upgrade to yet another feature set. Total consideration for Genline is approximately US$6.7 million, to be paid in cash at closing. The offer has been accepted by Genline's Board of Directors but remains subject to approval of Genline Holding AB's public shareholders and other ordinary course closing conditions. Genline expects to provide proxy materials to shareholders immediately and hold a Special Meeting of Stockholders shortly to vote on the transaction. Genline trades on the Stockholm exchange AktiTorget under the ticker symbol GENL. Upon completion of the transaction, Genline will join Ancestry.com's family of nine web properties globally, which together serve more than 1.2 million subscribers and host over five billion historical records and 17 million family trees containing 1.7 billion profiles. Genline currently has more than 17,000 paying members with access to 26 million pages of digitized Swedish church records spanning more than 400 years from the 16th to the 20th century. The full text of the Press Release can be found by clicking here on the GlobeNewswire, a NASDAQ OMX Company. In my recent series of articles on who owns the largest genealogy companies, I discussed both Ancestry.com and Genline.se. From the standpoint of availability, adding the Swedish records to Ancestry.com makes the records more available to users throughout the world. But the acquisition also raises some even more serious questions. Genline has always had the images of the Swedish Church records available for a graduated price allowing even a 24 hour license to be purchased. Ancestry.com has a monthly price and a yearly price for access to all of its online resources with both a U.S. only subscription and a higher priced Worldwide subscription. If the new files are brought in under Ancestry.com's present pricing structure, users will likely be paying considerably more for access to the Swedish records. A 24 hours subscription to Genline was only about $9.00 U.S. and an annual subscription of U.S. $248.00. Obviously, if a user had both subscriptions, there will likely be a savings. This consolidation of online resources seems to be moving ahead with an increasing momentum. Am I the only person who thinks that having the bulk of online genealogical resources concentrated in a relatively small group of companies may not be the best idea? 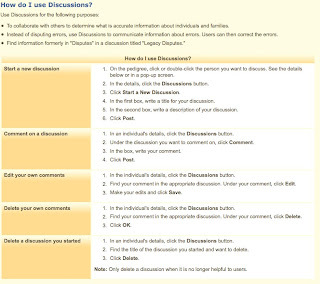 · New Discussions feature. 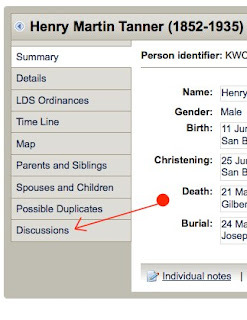 This feature allows users to post and respond to discussions about deceased persons in the new FamilySearch. Users can share and coordinate information they have. · New exact search feature. This feature allows users to do an advanced search in which they check which information (names, dates, or events) they want to be searched exactly as they entered the information. · Revised standardized places feature. The process has changed to help the user choose standardized place names. Standardized place names help the system search for specific records. ·Numerous smaller changes that enhance performance and make the system easier to navigate. There has been some discussion on one of the major problems facing users of the New FamilySearch program, that is, the number of duplicate individuals in the program and the inability of the users to correct or even comment on incorrect information. It is heartening to see that FamilySearch is addressing at least one of the problems; the ability to comment on the information contained in the file. I had a short look at the comment or discussion feature and it seems to be a good start at giving people a forum to express their frustrations with the inaccurate additions. But, there is nothing that will alert a users to the need to check for discussion information. As is happening currently, unsophisticated users duplicate the information already in the file, by simply uploading a GEDCOM file or typing in their information without checking for duplicates. There is nothing in the Beta program that would alert a user to the fact that there was anything in the Discussion field, so it is likely to be ignored like the admonition to check for duplicates. When anyone starts commenting on the Beta site, they should follow the instructions and read the known issues with the program before making any suggestions. Sometimes all the computer power in the world cannot help you find the family history records you are looking for. My Great-great-great grandfather, John Tanner, is a case in point. My research goal was really to look for John's great-great-grandfather, William Tanner. 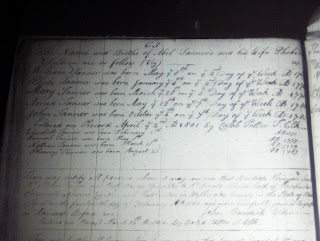 But the search for William eventually lead to direct information about John Tanner's birth, dates that had been passed down for hundreds of years and had been the subject of a number of books. Unfortunately, not one of those traditional reports had any reference to a source for the information concerning John Tanner's birth. Why John Tanner? He is noted as the first of the New England Tanner's to join The Church of Jesus Christ of Latter-day Saints. As mentioned, he has been the subject of a number of books and at least one movie. The recently released movie relates his conversion to the LDS Church and some few events of his life. See Christensen, T. C., Matthew D. Maddox, Shauna Thompson, Nathan Mitchell, and Michael A. Dunn. Treasure in heaven the John Tanner story. Orem, UT: Candlelight Media Group, 200. Tanner, George S. John Tanner and His Family: A History-Biography of John Tanner of Lake George, New York, Born August 15, 1778, Hopkinton, Rhode Island, Died April 13, 1850, at South Cottonwood, Utah. Salt Lake City: John Tanner Family, 1974. Tanner, Maurice. Descendants of John Tanner. 1942. In all those written works, there is very little citations to any sources. In that regard, it must be said that the concept of providing a source for genealogical information has been considered necessary only more recently. In order to find out information about the Tanner family, I decided to read through most of the early town record of John's birthplace in Hopkinton, Washington County, Rhode Island. 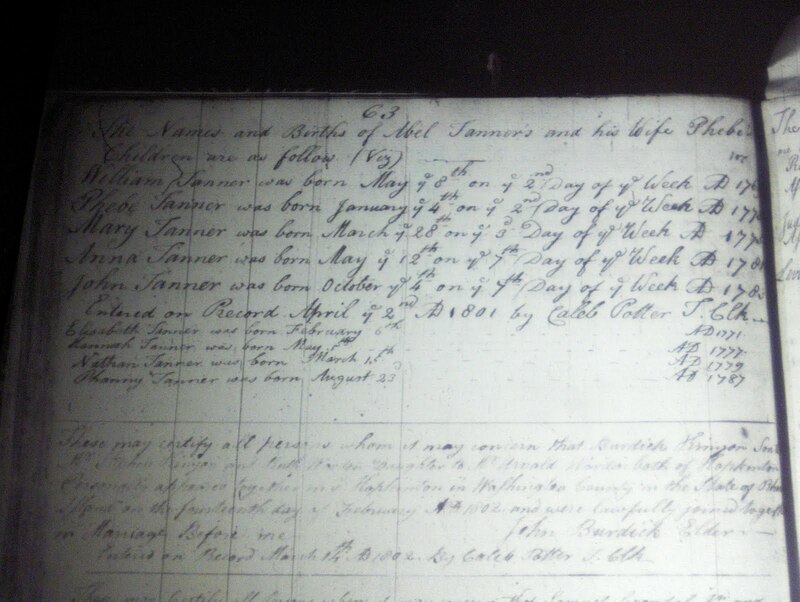 Hundreds of pages of handwritten records which finally revealed the birth record for John Tanner and his siblings. It is important to know that I did not know the record existed and I had never seen a reference to it. Additionally, there was no reason why the record should have been found in the town records. It just happened that the Town Clerk was also a Tanner and a near relative, probably and uncle. You cannot always see the end from the beginning. In this world of instant gratification and a whole lifetime of research in a one hour TV show, it is important to understand that research includes the word search and sometimes it just takes a head-on search, page-by-page and completely through the pile of documents or the rolls of microfilm. What do I own of my genealogy, if anything? During a number of previous posts, I reviewed the company ownership of various of the larger commercial subscription genealogy companies. Many genealogists are using these online services to store their own files. In this post, I examine the issue of the ownership of user placed online files. Indirectly, the ownership of the commercial subscription websites impacts ownership or control of everything they (the companies) post online including your own personal files. Selling products such as CDs, Maps, Books, Magazines etc. Providing online resources such as census records, vital records and many others both for free and for a fee. Offering space for storing user files of genealogy either for free or for a fee. Providing a forum for social networking either free or for a fee. Providing or selling support services including classes, online tutorials and other resources. Ancestry.com contains graphics, information, data, editorial and other content accessible by any registered Internet user and similar content which is accessible only to our subscribing members (“the Content”). Whether in the free section or in the subscription section of the Service, all Content is owned and/or copyrighted by Ancestry, or third party providers and may be used only in accordance with this limited use license. Ancestry.com is protected by copyright as a collective work and/or compilation, pursuant to U.S. copyright laws, international conventions, and other copyright laws. In other words, despite ownership claims to the contrary, subscription websites cannot claim either copyright or ownership of "preexisting material." If the preexisting material is in the public domain, incorporating it into an otherwise copyrightable work, does not make the preexisting work subject to either ownership or copyright. For example, since works by the U.S. government are not normally subject to copyright, incorporating a U.S. government document such as a draft registration card, into an otherwise copyrighted database does not make the card itself subject to a copyright. The real issue is the status of user submitted records. What if I load my family tree file into Ancestry.com or My Heritage or any other of dozens of similar online programs? Who "owns" the file that is uploaded? With free websites, there is no issue of a failure to pay the service fee, but even in free sites, there are some really interesting legal issues concerning ownership. If you have been following my previous discussion, you will know that I submit that lists and facts and figures cannot be copyrighted and also are not owned. If I record my birth date, I do not have either an ownership right in the date, nor do I have any expectation of copyright claim to the date and place. But to repeat, you can claim ownership to the method or design of the presentation of the dates and places. MyHeritage.com family sites that are on the free Basic plan are considered inactive if any Member or the Site manager of the site has not visited them for a period of 30 consecutive days. We may remove such inactive family sites in order to conserve resources. Prior to removal of inactive sites we will attempt to notify the site's Site manager via email, and provide an additional grace period of 30 days, after which the site, if still inactive, may be removed. We shall not be held liable for loss of data on inactive sites that are removed. You can imagine the repercussions if one of these huge websites discontinued their online service, but it is clear that they have warned their users that they could remove all of the files without any liability. So who owns the file you put online? Obviously, the concept of ownership is strained to its limit for the users to maintain any normally accepted concept of ownership. I will probably have to keep going on this subject for a while. Who owns the genealogy? and Why? In my last post, I addressed the question of who owns the genealogy? Ownership of the information is an interesting question. As an example, The Church of Jesus Christ of Latter-day Saints (LDS) microfilmed the Swedish Church records. A copy of the original microfilms is in the Family History Library in Salt Lake City, Utah. Another copy went to the Swedish National Archives. The Archives then "sold" the rights to these films to Genline.com. Genline then digitized the microfilm records and put them online in a subscription Website. Now, there is no doubt that the LDS Church microfilm made a valuable contribution to the availability of Swedish records around the world. It is also undoubted that Genline made a huge contribution by digitizing the records and making them available online. But to the average genealogist, researching Swedish records, the net effect is that you pay to go to Salt Lake to view the records, or you pay to rent a copy of the microfilm and have it sent to a branch library, or you pay for access to Genline and get the information online. None of these entities, the LDS Church, Genline, the Swedish National Archives or anyone else can be said to own the Swedish Church Records and if each of those entities had not contributed time and money to the preservation of the records there would be no justification for imposing any kind of charge for viewing the records. Unfortunately, many record repositories charge to view records. For example, try to get a copy of your own birth certificate. You may end up paying from $5 on up for a single copy. Does the state own your birth information? Do you own your own birth information? In this context the question of who owns what are somewhat meaningless. The state has the copy of your birth record and if they want to charge you to obtain a copy, there is no one, short of some legislative act, to stop them from doing so. If you decide that you want to share your genealogical records online, say in one of the large online databases, like Ancestry.com's Family Trees or MyHeritage.com, who owns the file once it is loaded into the online database? Do you determine when and if the file is made available to your relatives or even to yourself. What if you use a fee based genealogy company like MyHeritage and you stop paying the fee. What will happen to "your" genealogy? Have you ever rented a storage unit? Have you ever failed to make the monthly payment? Do you know what happens to your stuff if you fail to pay? What if you put your life's work of genealogy into an online service and then you die? Who owns the file? What if your heirs don't know enough about your affairs to pay the monthly or annual fee? What will happen to your file? What if the file is on a free database? What happens to your file if the company goes out of business? Same question, same answer, do you own your genealogical information? I would submit that no one owns information. I do not own my own birth information, neither do I own the information about any other of my relatives. A fact, a piece of information, cannot be bought or sold. What can be bought and sold is the service of providing the information. If you have a legal question and you come to me as an attorney, I do not own the answer, but if you want the answer that I already know, you can either go to law school and figure out yourself, or you can pay me to tell you the answer. The situation is the same with genealogy. If I have you grandfather's birth date and you would like to know that information, you can either try to figure out where I got the information and find it yourself, or you can pay me a fee to give you the information I have already found. Is the convenience of having the information quickly and in a usable format worth anything? Apparently so, since millions of people pay online services just for that reason. The online service may have the only available copy of certain types of information, such as Footnote.com's scans of the U.S. National Archives. I could pay my way to Washington D.C. and go through the hassle of doing research directly in the Archives, or I can pay a much smaller fee for someone else to provide the record to be directly online. I guess I will keep going on this topic for a while, I am still not quite to the finish. During the past few posts, I have been examining who owns the genealogy companies. What I find is a mixture of huge multinational corporations and family owned businesses. I did have an ulterior motive in examining the ownership however, I had several larger issues to discuss and needed to know a little background before I jumped into the controversial arena. When you realize the diversity of the ownership of the larger genealogy companies, you can imagine extending the diversity to the hundreds of smaller business organizations in today's genealogy marketplace. The first question is this: Who owns the genealogy? If I do some research and identify my grandparents, do I own that information? I mean, not in the copyright sense, but in the real down-to-earth personal control type ownership. If you have ever thought about the subject of ownership, you probably realize that the whole concept is defined by the society you live in. The whole concept of private ownership is societal based. Now, let's think about owning genealogy. Do I own my research? What rights do I have as a result of having done the research? Again, I am not talking about the statutorily created concept of "copyright" but the idea of ownership. In my experience, most people would claim ownership of anything they felt they had either personally created or obtained through purchase or as a gift. In contrast, what if you were hired to do the research? Would you feel the same sense of ownership, or would you acknowledge that the person that hired you owned the research? This idea of ownership is at the core of many of today's genealogy issues. Who owns and idea or information? I commonly hear the mantra that no one owns an idea. But, in the U.S. we have an elaborate system of copyright/trademark/patents to the contrary. I may not own the information about my Grandfather's life, but if I put it into a book, the book is automatically copyrighted under the current U.S. law. Copyright law gives me a whole bundle of rights to my work. But let's go back to the core. Can anyone really own an idea? Not under any present law in the U.S. What about information in the sense of facts and figures? Once again, under our laws, no one really owns information. Then what am I talking about? I am talking about a real phenomena, ownership of work product. I have found again and again, that people believe they own their genealogy. Now let's scale this up a bit. What if my great Aunt does a lot of genealogical research and manages to identify six generations on my father's line. Does she own the research? What if she gives me a copy of the file? Do I now own that research or does she retain some kind of ownership? What if I don't believe anything she gave me and go out and do the same research over again? Do I now own the research assuming that my conclusions are exactly the same as my Aunt's? What if my conclusions are different? What if one of my cousins goes out and does the same research over? Does he now own the research? At this point, you can probably see that the idea of ownership of information is fundamentally different than the concept of ownership of either real or personal property. If I own a car, for example, even if it is a common make or model, I still have a unique item which can be identified. If someone else goes out and purchases exactly the same make and model of car that I own, I still have my own car and it is completely distinct from that of someone else. No one would argue that by purchasing a similar car that anyone would somehow obtain an ownership interest in my car. But, in the world of genealogy (and other information based disciplines) I venture to say that most practitioners would believe they had an ownership interest in the information in their own file, especially if they spent the time to do the research. The example of the car ownership points out that the idea of ownership of information or ideas is an illusion. Physical objects (at least in the common experience sense) can only be in one place at one time. But the same exact information can be in multiple locations at the same time. Whether my relatives share their information with me or not, if I do the research, theoretically, I can reproduce anything they have. Here is another issue with the concept of the ownership of information. What happens to our "ownership" when we die? It is a sad fact that every day, every hour, every minute we are losing valuable genealogical information as people die all over the world. When you last living sibling of your father or mother dies, that may be the last time anyone could have identified all of the people in those old photographs. So, in addition to the challenge of the illusion of ownership, information and ideas are ephemeral. Have you ever thought about what will happen to all of your genealogical research, papers, books, records, files etc. when you die? Who will own the information when you die? It looks like I am going to have to break this down into smaller units. So I guess the next post will continue the discussion. Here is the question for the next post; Who owns the genealogy I post online in a database? I had to cut off this series at some point and decided to do so with a look at HeritageQuest. This site is probably one of the least promoted of the subscription sites I have reviewed. This Internet service is only available through libraries. If you have a library card or membership in a participating library, it is likely that your access to HeritageQuest free online. Here in the Phoenix area, a library card with the Maricopa County Library will get you free access even on your home computer. HeritageQuest has all of the U.S. Census records but indexes only to some years. The other resources include PERSI, an index to over 2.1 million genealogy and local history articles, the Feedman's Bank records and the U.S. Serial Set from the U.S. Congress. ProQuest creates specialized information resources and technologies that propel successful research, discovery, and lifelong learning. A global leader in serving libraries of all types, ProQuest offers the expertise of such respected brands as CSA™, UMI®, Chadwyck-Healey™, SIRS®, and eLibrary®. With Serials Solutions®, Ulrich's™, RefWorks®, COS™, Dialog® and now Bowker® part of the ProQuest brand family, the company supports the breadth of the information community with innovative discovery solutions that power the business of books and the best in research experience. From their website, ProQuest is located in Ann Arbor, Michigan and lists a large Management Team. In looking at one of the most confusing state government websites in existence, the Michigan Department of Energy, Labor & Economic Growth, if you persist, you will find seventeen entries for the names of various businesses which inclued the word ProQuest all of which are amazingly uninformative. There seems to be no way to determine if all of these various entities are related or not. It is very unlikely that ProQuest Restoration, Inc. is related to the information company, for example. It appears that ProQuest is not a very unique tradename. From Wikipedia, ProQuest is part of the Cambridge Information Group. Cambridge Information Group (CIG) is a privately owned group of information services and publishing companies and educational institutions. It was founded in 1971 by Robert N. Snyder and Philip E. Hixon and is headquartered in Bethesda, Maryland. As of 2007, CIG’s operating companies are ProQuest, R.R. Bowker, RefWorks, and CIG Education Group. CIG Education Group is the owner of the Sotheby's Institute of Art, and Bach to Rock music school (B2R). CIG is also the largest shareholder of Navtech, Inc.
ProQuest dates back to the 1930s and was founded by Eugene Power in Ann Arbor. By June 1938, Power worked in two rented rooms from a downtown Ann Arbor funeral parlor, specializing in microphotography to preserve library collections. This was the foundation of University Microfilms International and Proquest.Got all that straight? A search of the ProQuest Products and Services under the term "genealogy" give 47 different ProQuest genealogy products. The list of products for genealogy is truly impressive, but none of them are available for individual users. In fact, an individual user cannot even obtain a free trial access to the databases. It seems that ProQuest is operating entirely in the commercial arena, along with such huge databases as WestLaw and Lexis Nexis. It appears that ProQuest had an initial public offering (IPO) of its stock back in 2002. The stock was listed on the New York Stock Exchange as PQE. It appears the company had some serious legal and financial problems in the 2006 to 2007 time range. See NYSE Euronext. I do not find where the stock is current listed. What is going on with FamilySearch?